Sancho Panza, the name of this world class cigar brand was stated from a famous novel written in 1605. The journey of Sancho Panza was initiated in 1852 when Emilio Ahmsted decided to produce some uniquely flavored cigars for his local people. In 2001, the version of Honduran was introduced under Sancho Panza that offers smoothing but rich taste. The specialty of Sancho Panza is its full bodied flavor cigars. Range of Sancho Panza is quite larger just like Enormous Sanchos or Shaped head Belicosos. 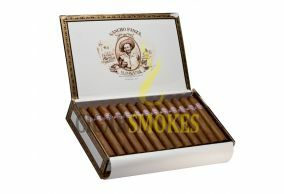 Sancho Panza is produced as medium body, and all the cigar forms are manufactured as handmade. All cigars are crafted under the supervision of Estelo Padron who used to be a cigar master of legendary Hoyo de Monterrey.